Five-star recruit Ryan Kelly, a 6-foot-10 power forward from Raleigh, gave a verbal commitment to play for Duke next year in a televised press conference Thursday afternoon. The announcement aired on ESPNU. Three months ago, Kelly was barely being recruited by Duke, and most thought he would decide between Notre Dame and North Carolina. Before the Olympics, however, Kelly and Duke head coach Mike Krzyzewski met and formed a relationship that will culminate in Thursday’s announcement. Kelly, scout.com’s No. 3 power forward in the Class of 2009, scored a 2150 on his SAT and made academics a priority in his search. He took official visits to Vanderbilt, Notre Dame, Georgetown and Wake Forest and visited North Carolina and Duke numerous times over the course of the recruiting process. The North Carolina native joins fellow Tar Heel Mason Plumlee in Duke’s next incoming class. The Blue Devils are still heavily recruiting five-star shooting guard Kenny Boynton. More analysis to come, particularly after the official announcement. 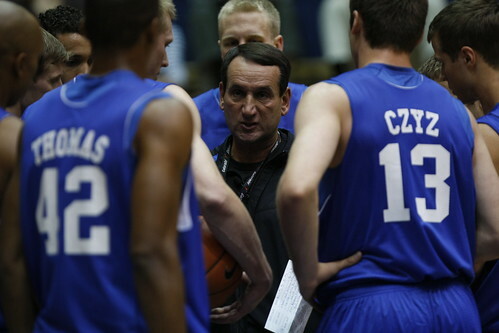 One question to start, though: How much has Coach K’s gold medal already had an impact on recruiting? The day before the Blue Devils are officially revealed to the public, they will be unofficially featured. Head coach Mike Krzyzewski announced the annual open practice will start at 5 p.m. Oct. 17, with the team’s Blue-White scrimmage slated for 1 p.m. the next day. Cameron Indoor Stadium’s doors open Friday at 4 p.m.